What are the 3 key things in vegetables that make them so nutritious for us? Fibre promotes good digestive health but also lowers cholesterol, stabilizes blood sugar, protects against diabetes, and can help you keep full to manage a healthy weight. Fresh veggies contain more vitamins and minerals per calorie than any other food group. Phytochemicals are protective compounds in plant-based foods that have health promoting and disease preventative effects. Since there are hundreds of phytochemicals in vegetables and these can’t be consumed in a supplement, be sure to eat a variety of veggies each day to maximize your health. What can you do if you don’t have a large amount of space to plant a full garden? 1. Plant one in your yard if you have space and plenty of sun. 2. Plant container gardens by placing in planters/pots on sunny decks. 3. Join a community garden and rent a plot. Another option is to consider a U-pick farm or visit your local farmers market if you want the benefits of a garden but don’t have the space or time to do it yourself. What is good to grow? If you don’t have much space consider lettuce, kale, swiss chard, arugula, spinach, herbs and tomatoes in containers and planters. Cut salad greens as they are ready and reseed once the plant goes to seed or becomes bitter in taste. 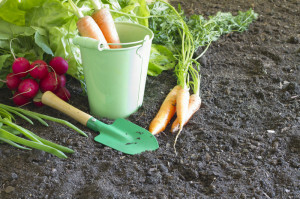 If you have additional space and/or a plot consider adding carrots, beets, radishes, potatoes, onion, garlic and squash. Other great perennial options that take some time to establish include asparagus, raspberries, strawberries and rhubarb. What are the key nutrients in your garden? Tomatoes and tomato based products (bruschetta, salsa, canned stewed tomatoes, tomato sauce) contain lycopene which reduces the risk of prostate, lung, stomach, breast and colon cancer. Berries are especially high in phytochemicals including cancer preventative carotenoids and are some of the highest fibre fruits around. Soluble fibre in berries help to reduce cholesterol. Visit the Health Stand Nutrition Consulting website at www.healthstandnutrition.com for more nutrition information and healthy recipes. Also check out the community garden resource network, a project of the calgary horticultural society www.calhort.org/community-gardens.aspx for community garden locations and gardening resources.